In rotating disc reactors (RDR), the principle behind the intense transport of substrates and oxygen to the biofilm is different. In trickling filters and fixed bed reactors, water and air are moved; here, the support material with the biofilm are moved. In rotating disc reactors, circular plates with diameters of 1-2 m are fitted to a horizontal shaft with a spacing of a few centimeters. The system of parallel plates is submerged nearly halfway in a cylindrical tank through which wastewater flows. The packet of plates rotates at a speed of 0.5-5.0 rpm. Bacteria grow on both surfaces of the circular discs. During the portion of the rotation where the biofilm travels through the air, wastewater drips down and oxygen is taken up by convection and diffusion. Parts of the biofilm rinse off from the discs from time to time. Larger pieces settle in the tank and must be removed as surplus sludge, while smaller parts are suspended and involved in aerobic substrate degradation and further growth (carbon removal and nitrification). Figure 7.4 presents a rotating disc reactor. The development of this kind of biofilm reactor was described in detail by Breithaupt (1997). Its practical application started in the 1960s. The company Stengelin used plates made of low-density synthetic material to decrease the weight which must be born by both bearings. This made it possible to increase the length of the shaft between the bearings to up to 7 m (Breithaupt 1997). Different materials with low density have been utilized in the past 35 years in laboratory- and pilot-scale RDRs (Table 7.3) for carbon removal and nitrification, to test new materials and to optimize the process. In order to increase the surface area of the support material and to obtain a thicker and more stable biofilm, some authors used special synthetic media. The BIOSURF system was already used commercially in the late 1970s (Benefield and Randall 1980). Tyagi et al. (1993) utilized a polyurethane foam material for the aerobic treatment of a petroleum refinery wastewater. Breithaupt (1997) and Lindemann (2002), experimented successfully with a RDR and plates covered with a structured textile material made from polyethylene styrol. Fig. 7.4 Rotating disc reactor, Mecano SA Maschinenfabrik, Schwericon SG, Switzerland. Table 7.3 Results for COD removal of different experiments with aerobic treatment of municipal wastewater and rotating disc reactors (Breithaupt 1997). with the data from Table 7.2 for the fixed bed reactor (BIOPAC system; Schulz and Menningmann 1999; low rate up to high rate), if we equate BOD5 with COD in this approximation. Axial mixing is reduced in a RDR and the concentration of COD decreases continuously as in a tube reactor (Fig. 7.5). Fig. 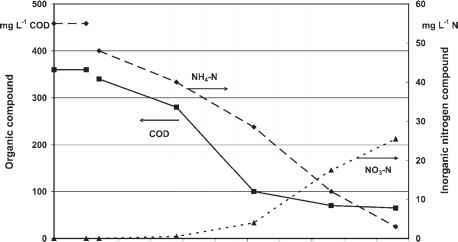 7.5 Decrease in local COD and NH4-N concentration as well as increase in NO3-N concentration during aerobic treatment in a laboratory-scale rotating disc reactor (Breithaupt 1997). 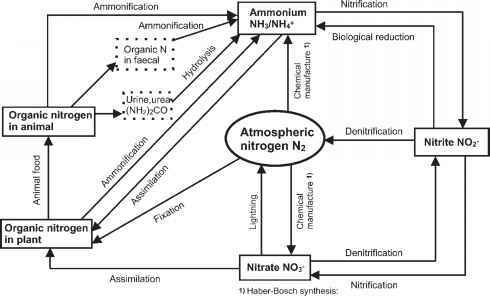 In municipal wastewater containing ammonia, nitrification occurs simultaneously as a result of the immobilization of nitrifying bacteria (see Chapter 10).